Creon (greek. Κρέων - Kreōn; κρείων (kreion) : Regent, God, Master; Latin. Creon: ruler) is a name that occurs in Greek mythology in several scenarios. Creon, a son of Menoikeus, king of Thebes(which esoterically corresponds to the Savadisthana Chakra). Creon became known by the Heracles myth and the Phoinissai of Euripides, the Oedipus myth and by Sophocles' Antigone. 1. In the Heracles myth, Heracles liberated the Thebans from the tributary of the neighbor king and killed the Kithaironian lion. King Creon gave him therefore his daughter Megara ('Pearl') : Universal Path step 4. The Phoenician king Agenor of Tire was inconsolable about the loss of his daughter Europe. Zeus had robbed her and brought her to Crete. He therefore sent his sons Cadmus, Phoinix, Kilix, and his daughter Telephassa on the search. The oracle, to which the latter turned, told Kadmos to end the search and instead to search for a cow with a white mark. As soon as he had found her, he was to follow her: Where the exhausted beast would rest he should found the town Thebes. So became Cadmus(Greek: Κάδμος Kadmos) finally the founder and first king of Thebes. As a Sparti or Spartoi (Ancient Greek Σπαρτοί, "sowed") are those progenitors of the Thebans denoted, who emerged from dragon-teeth sown from cadmos in furrows. 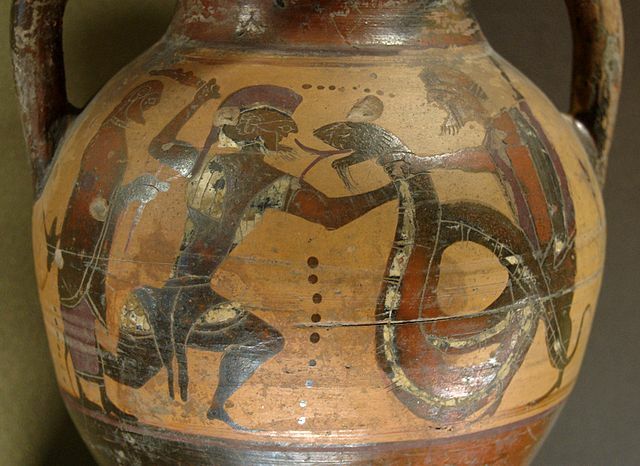 Near the place where Cadmus was to found Thebes was a sanctuary sacred to Ares, which was guarded by a dragon. When the thirsty companions of Cadmus(Kadmos) came to this spring, they were killed by the dragon. When Cadmus came to to the dragon in search of his companions, he could only kill him with great difficulty. Athena then advised Cadmus to stray the dragon-teeth into freshly drawn furrows. King Kreon of Thebes descended from those men, who sprang from the dragon-teeth, which Thebes' founder king Kadmos had sowed. After Sophocles, he was a son of Menoikeus, and had a connection with Cadmus, as did his sister Iocaste. Menoeceus (Greek: Μενοικεύς Menoikeús) was both the father of Creon and of Jocasta and Hipponome and grandfather and legal father of Oedipus. This Menoikeus was the theban grandson of Pentheus and a descendant of the Spartoi. Another Menoeceus was the son of Creon named after his grandfather. With his wife Eurydike ('wide justice'), an oak-nymph or a daughter of Apollo, Creon was, according to Sophocles, father of three sons: Haimon, Megareus (also Menoikeus) and of the daughters Megara ('pearl'), Henioche('charioteer') and Pyrrha (Greek purrhos: colored flame) . In the Oedipus myth, Kreon has three periods of government, which from an esoteric point of view correspond to the 3 lunar phases of steps 8, 10, and 12. At Creon's first reign, Hera sent the Sphinx to the Thebans. As brother of Iokaste ('shining moon') he was brother-in-law of the Theban king Laios, and then brother-in-law and uncle of Oedipus, and also uncle of the Oedipus / Iocaste - descendants Antigone, Ismene, Eteocles, and Polyneices. A. When Laios was killed by his own son Oedipus, Creon took over the rule over Thebes as the brother of the wife of Laius. B. When Thebes suffered years later under the plague, the blind seer Teiresias ('indication, sign') revealed, that Iokaste was really the mother of Oedipus, and that Oedipus had killed his father Laios. Teiresias was the son of shepherd Everes and the nymph Chariclo. He lived for seven generations and began as a consultant to Cadmus. His blindness is often attributed to the fact, that he was blinded when he saw the virgin Athene bathing, which gave him the gift of prophecy as compensation. The Michelspacher Cabala shows a similar blind man. Many other sources say that Athene had became angry that Tiresias used his co - workers to strike two mating snakes (possibly Ida and Pingala of the snake staff of yoga, as well as Tarot card 10). She transmuted him into a woman for seven years. The goddess repented her impulsive action. Since she could not reverse the transformation, she gave him instead the gift of prophecy. Oedipus had therefore to leave Thebes, and Kreon was again the ruler of Thebes. C. In Antigone, Oedipus sons Eteokles ('truly beautiful, rightly famous') and Polyneikes ('great victory') took Kreon's reign and agreed to govern alternately annually(According to Apollodorus and Diodorus). But King Eteokles refused to resign, and Polyneikes allied himself with neighboring princes, and attacked Thebes. Both brothers were killed. Therefore, as guardian of Laodamas (Greek Λαοδάμας, 'people subduing'), the son of the formerly expelled and in the battle killed Eteokles ('really great'), Kreon again ascended the throne of Thebes.